Set your alarm. Or not. Jealous your friends are all pre-ordering the iPhone 5C today while you're left twiddling your thumbs, iPhone 5S hopefuls? Turn that frown upside down, because Apple has now confirmed an exact time you'll be able to buy that swanky new 5S. Apple issued one of its traditional emails to customers early Friday to herald the arrival of the iPhone 5C, which can now be pre-ordered from its online store starting at $99 with a two-year agreement (SIM-free £469/AU$739) in your choice of five colors and two storage capacities, 16GB or 32GB. 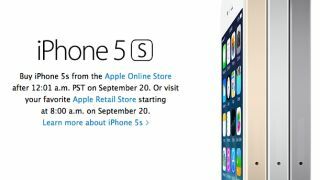 But tucked away at the bottom of the email is the news eager iPhone 5S buyers have been waiting for: The flagship device goes on sale in the U.S. Apple Online Store beginning at 12:01 a.m. PT next Friday, Sept. 20. For those who would rather roll into an Apple retail store instead of waiting by their computer, the doors will swing open at 8 a.m. local time the same day, although if history has taught us anything, it's likely to be a typical launch day madhouse. While Apple hasn't yet confirmed a launch day time for other parts of the world, the iPhone 5S will also roll out to Australia, Canada, China, France, Germany, Hong Kong, Japan, Singapore and the United Kingdom. For our readers in Australia, the on-sale time for the U.S. online store corresponds to 5:01 p.m. Melbourne time, while across the pond in London it's 8:01 a.m. local time. In the U.S., the iPhone 5S starts at $199 with a two-year agreement or $649 unlocked for 16GB, while a comparable unlocked model in the U.K. and Australia is priced at £549 and $869, respectively. Last but not least, the iPhone 5S is available in your choice of silver, space gray or a new gold finish and will also be available from select Apple resellers including carrier partners in the 10 launch countries. Feast on our review of the new Samsung Galaxy NX camera!